he 1970's and 1980's had been tough decades for Parker. There wasn't much buzz around high class fountain pens and for many years Parker relied heavily on the famed Parker 75 as their top selling item. Of course there were other pens offered during this period. The famed T1, a very collectible pen made in titanium, but this provßed too hard and expensive to manufacture and didn't really catch the public eye either. The Parker 180 with a new style, double sided pointed nib is also very collectible but this didn't bring home much bacon either. The Premier was very much an upscaled Parker 75 and of course the low end Vector, which eventually became one of Parkers long survivors. its subsidairy in Newhaven, UK and by 1993 the company was in turn sold to Gillette who, in 2000, shut down the old Geo. S. Parker Arrow Park factory in Janesville, Wisconsin and had 300 workers laid off. Which in fact ended the Parker as an American pen brand. s for ball pens and roller balls Parker relied heavily during the 1980's on the Jotter for the low end market and the Classic as a top end pen. By the 1990's Parker needed to revitalize the $10 to $100 gift market and commissioned Hollington Associates in London to design a completely new ball pen and pencil. The Insignia was introduced in 1991. The principle designer of the pen being Geoff Hollington (who went on to design the Sonnet in 1994 and award winning Parker 100, inspired by a jet engine, in 2004.) The new line was marketed as a precision-crafted, high-performance writing instrument based on an ergonomic design. 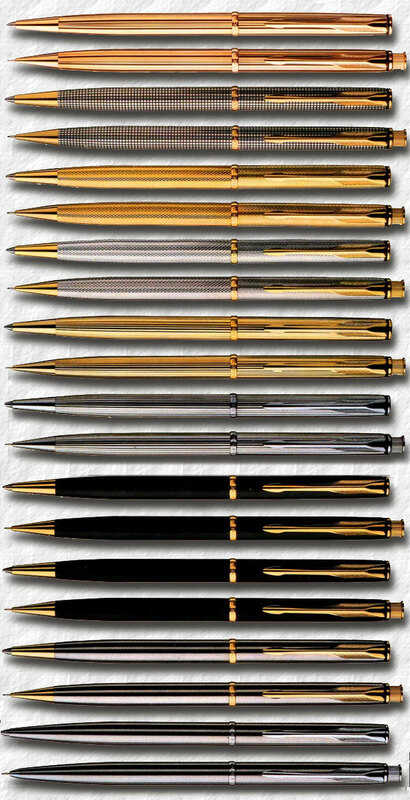 As a top-line Parker it qualified to bear the Sterling Silver Cicelé pattern that Kenneth Parker once "borrowed" from a cigarette case in the early 1960's, made by a London silversmith, and used on the Parker 75.
arker boasted 5,5 km of skip free writing for the ball pen that worked with a twist action. The pencil had a new two stage button action continous feed with a retracting tube ment to prevent the pencil from getting stuck in the pocket. 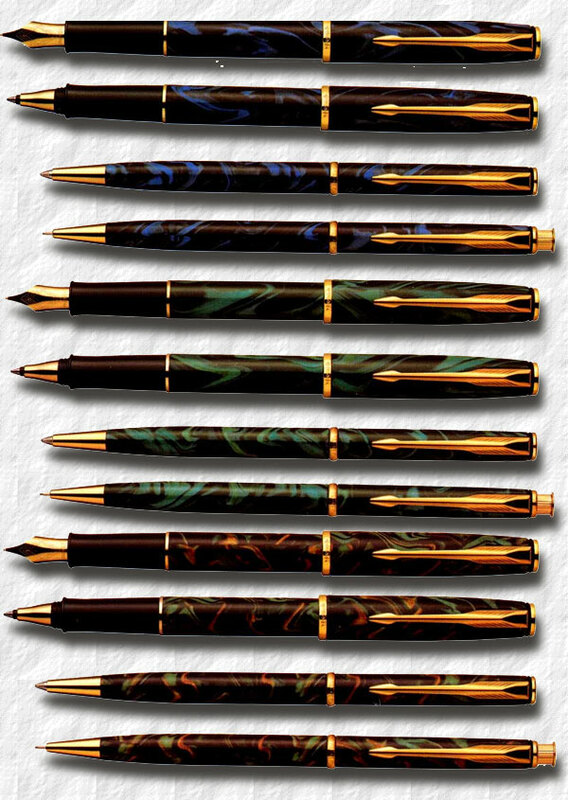 y 1997 the laque pens were replaced by custom pens with laquered barrels and 14k dimonite G gold plated caps. The Black laquered pen was offered in both the laquered and a gold plated cap versions. 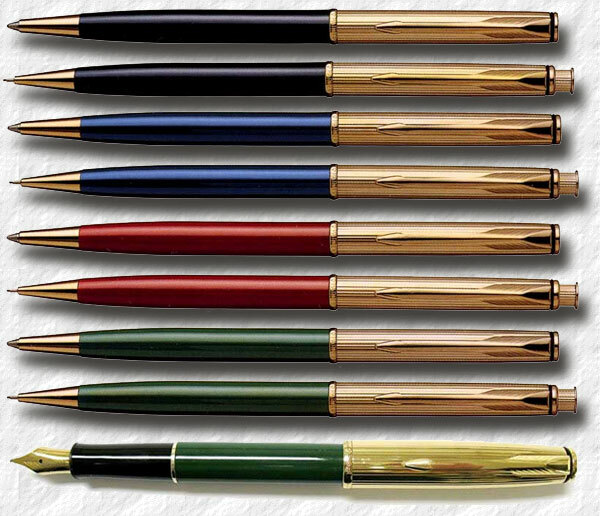 Although they are not depicted in the catalogue custom fountain pens were also produced. 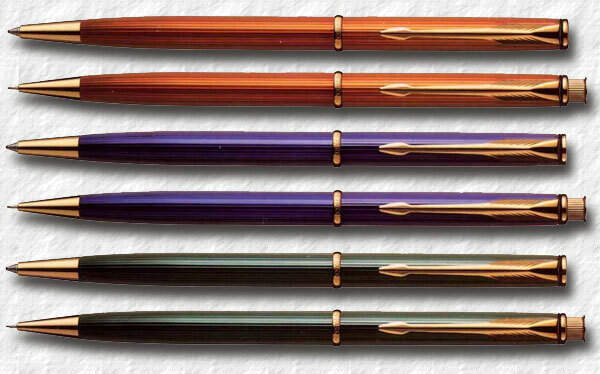 n 1998 the blue, burgundy and green custom pens were replaced by intricate laquered designs, not unlike the thrift time pens of the 1930's. There was also a fountain pen offered in these three designs, along with the custom version, the only Insignia fountain pens made. Very attractive and and very collectible. n 2001 the gold plated grain d’orange was discontinued aswell as the three laquered finishes. The word "Dimonite" was dropped from the fileté gold pen and in the 2003 catalogue all Dimonite references had disappeared. The Dimonite z was renamed Gunmetal Fileté. his setup remained until 2005 when most old designes were phased out. The Matte Black with chrome trim (CT) was introduced and the Laque black was redesigned with a stainless steel cap. Also three new coloured laquered designs were introduced in Satin blue, Burgundy and the innovative Spiral Blue with a stainless cap. n 2007 the last design of the Insignias was introduced, the very attractive chiselled Perlé. The Insignia was discontinued in 2008.